12%. Yeasty nose and a lot of initial froth. Good acidity at first, but the bubbles disappear fast and there's no concentration of fruit. Lacks any character and towards the end is a struggle to drink. Not popular at all. 12.5%. Aromatic, floral nose with a tart but full flavour and a long finish. Herbaceous cool climate wine, good character. 12.5%. Rich, aromatic nose - a little sweet Moscatel coming through. Clean and fresh on the palate, if a little watery. Smooth mid-palate with a herbal bitterness and hot on the finish. 12%. Sweet Orange and Lychee nose (Cointreau). Mouthfilling consistency, sweet on the palate but relatively clean and fresh, not cloying. A popular wine. 5. Vino Docetañidos 2011 Pago de Valdeátima Rosado, Cigales D.O. 13%. Strong red fruit nose and a salty aspect on the palate, a touch coarse, ending hot. There's some beetroot flavour. The nose over-promises, but "full of character for a Rose". 14%. Peppery and smoky on the nose with some liquorice. Youthful tannins on the palate with a long finish. At first it is all about the oak, but on sitting Toffee and caramel appear and the texture goes rich and warm. A lovely wine. 14%. Cool and fresh with a minty aspect on the nose, fruit is lacking a little and vanilla is evident, oak is coming through maybe a little too much? Tannins still quite steely, although more melded than the Murrieta. "Old nose, old taste". 14%. Roasted notes in the nose, a complex but not particularly married wine, too much going on, "hot" with strong acidity (paralysing the palate). Heading to a Port style this is way too young, possibly by 5 years. 12.5%. An elegant, refined and subtle nose, slightly spicy - everything the last wine wasn't with clean acidity and mature tannins. The nose changes in the glass, going truffley. It may have lost some of its bloom and dries a little from back to front (?) but this is something special. 10. Torres 2003 Mas La Plana, Penedès D.O. 14%. Tannic and still quite fresh, some leather and polish on the nose and a little charcoal. Savoury, chewy, meaty with an "old" taste, maybe a little stewed. Some doubt about where it is going to go but a pleasant wine with characteristics of it's younger siblings previously tasted. Spain is a large and diverse country, the third largest wine producing nation behind France and Italy with 35 million hl (4.66 Billion bottles) although it has the largest global vineyard at just over 1 million hectares (nearly 14%) due, in part, to the very low yields and wide spacing of the old vines planted on dry, infertile soil. The country has an abundance of native grape varieties, over 400, though 80% of the country's wine production is from 20 grapes—including Tempranillo, Albariño, Garnacha, Palomino, Airen, Maccabeo, Parellada, Xarel·lo, Cariñena and Monastrell. 14 Vino de Pago (VP, previously also referred to as Denominación de Pago or DO Pago) - Individual single-estates with an international reputation. After the 2009 EU reforms vintage these will probably be known as VPP (Vino de Pago Protegida). 2 Denominación de Origen Calificada (DOCa/DOQ - Denominació d'Origen Qualificada in Catalan): quality wine regions with a track record of excellence. From 2009 these can be DOPCa/DOPQ - Denominación de Origen Protegida y Calificada/Qualificada. 69 Denominación de Origen (DO - Denominació d'Origen in Catalan) - mainstream quality-wine regions. From 2009 these will be DOP - Denominación de Origen Protegida. 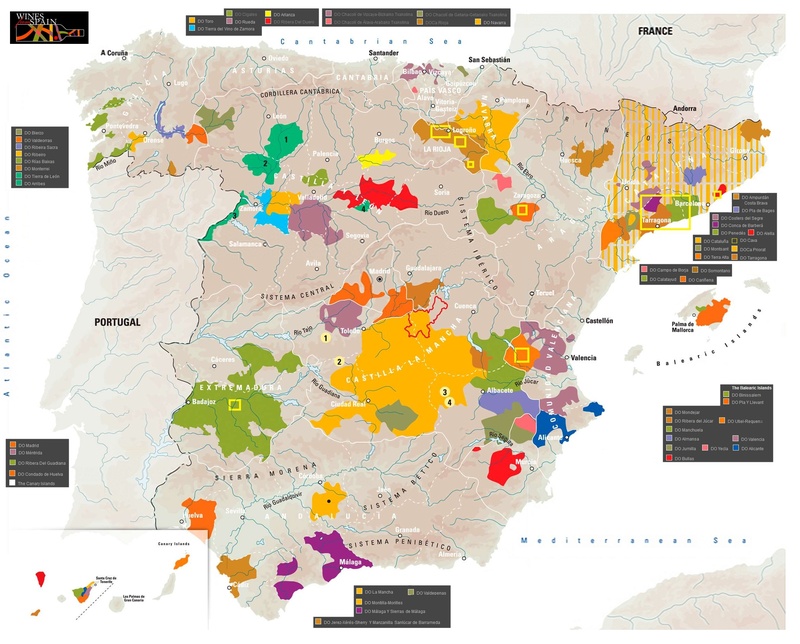 41 Vinos de la Tierra (VdlT) - "country wine" areas which do not have EU QWPSR status but which may use a regional name. From 2009 these will become IGP - Indicación Geográfica Protegida. Vino de Mesa - Table wine, production of which has been in decline in recent years. This is being replaced in part with Viñedos de España which, under the 2009 EU regulations, may state a vintage date and grape variety on the label. The northern and north-western portion of Atlantic Coast Spain can be cool to cold, wet, and green—thus its name, España Verde – Green Spain. This includes Galicia, Asturia, Cantabria and the Basque Country. North Central Spain hosts extremely elevated but easily workable vineyards along and beyond the banks of the Duero River, primarily Castilla-León. The Meseta is the “Tabletop”, the large, arid Iberian plateau centred on Madrid and covering Castilla–La Mancha and Extremadura. Almost two-thirds of all Spain’s vineyards are on these arid, lifted plains. Andalucía in the South, with temperatures easily surpassing 40°C (100°F) in the summer, is an area ideal for fortified and dessert wines as Ken showed us last year.